Chick-fil-A Donated $1.8 Million to Anti-LGBTQ Groups in 2017The company had said in 2012 that it would stop doing this. Is Sweetgreen Fast Food?A CDC report on adult Americans’ eating habits lumped the salad chain in with the likes of McDonald’s. It’s Time to Remember That Fast-Food Companies Are the WorstFast-food chains are winning the food culture wars, but we shouldn’t lose sight of how destructive they can truly be. Trump’s Fast-food Diet Gets Even More UnsettlingHe reportedly downs multiple Big Macs, Filets-O-Fish, and a chocolate shake in one meal. Taco Bell Hopes to Succeed in China With Margaritas and Alcoholic SlushiesSounds like a solid game plan, to be honest. Here’s McDonald’s Latest Plan to Make Its Restaurants Less MiserableIt’s something restaurants have been doing… forever? Is the Depressing Presidential Campaign Torpedoing Burger Sales?Even cheeseburgers can’t comfort uneasy Americans. New Restaurant Chain Charges Low-Income Families Less for MealsEverytable uses per-capita income data to determine neighborhood pricing. Ocean’s Fish Now Addicted to Eating PlasticThis can’t be good. Against All Possible Odds, People Are Actually Buying Burger King Hot DogsThe chain’s largest operator says they’re selling 80 to 120 a day at all of their locations. Chipotle’s Giving Away Free BurritosTo make up for the fact that they’re closed for an all-hands-on-deck food-safety conference. McDonald’s Serving Mozzarella-Less SticksJust as sales were improving and things were starting to turn around. Steak ’n Shake Thinks It’s Too Cool for Value DealsThe fast-food favorite promises its prices won’t rise this year. Fast Food Might Be Even Worse for Kids Than You Already ThoughtA study links greater “neighborhood access” to fast food to lower bone mass in kids. 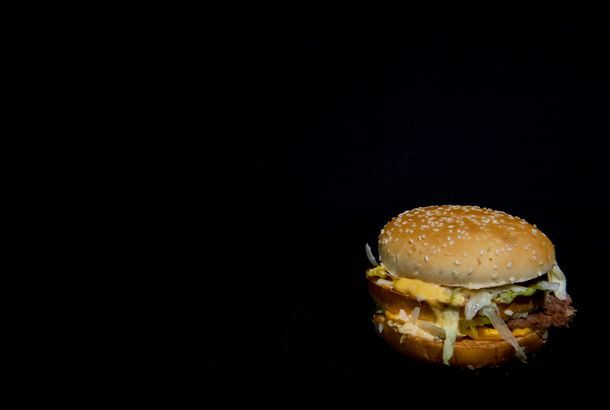 Study Shows One Third of American Kids Eat Fast Food on Any Given DayA new report by the CDC says it accounts for 12 percent of kids’ total calories. McDonald’s Will Launch All-Day Breakfast on October 6Get ready for the nationwide rollout. A $15 Minimum Wage Will Only Raise Big Mac Prices by About 22 CentsFast food will still be very, very cheap. McDonald’s Prepares to Finally Give Everyone All-Day BreakfastCustomers have only been asking for this since forever. Gloria Steinem Calls for Higher Wages for Fast-Food WorkersShe’s pushing for $15 an hour — up from $8.75. There Are About to Be a Whole Lot More Wendy’sThe chain plans to open 1,000 more locations by 2020. L.A.’s Radical Fast-Food Ban Didn’t Lower Obesity Rates at AllPeople actually got fatter. Americans Ordered 9 Billion Burgers in 2014That’s 30 million more than last year. A Study Linked Increased Fast-Food Consumption to Poor Test Scores in KidsIn some cases, eating chain restaurant food every day lowered test scores by four points. Fast-Food Drive-Throughs Are Slower Than Ever Because of All the Gimmicky MenuBlame waffle breakfast tacos, chicken fries, and Doritos-laced everything. Even Conservatives Support a Wage Hike for Restaurant WorkersMeanwhile, the city’s minimum wage will most likely reach $15.22 per hour in five years. Fast-Food-Toy Ban Could Be Very EffectiveIt’s all about the free barbie.